Within the regulated health professions, mandatory reports help to protect the safety of the public. What are these reports, why are they so important to regulation, and when are they made? The Regulated Health Professions Act, 1991 (RHPA) requires that employers/business associates file a report with a regulatory body whenever they restrict a professional’s practice, suspend or terminate the employment of a professional, or dissolve their business relationship with a professional for any of these reasons --professional misconduct, incompetence, or incapacity (see definitions below). There is an obligation to file the report even if the professional (the medical laboratory technologist (MLT)) resigns. Facility operators must also file mandatory reports when they have reasonable grounds to believe an MLT who practises at their facility is incompetent, incapacitated, or has sexually abused a patient. The report must be in writing and filed within 30 days. Failure to do so may result in a fine of up to $25,000.00. Mandatory reporting is vital to public safety because regulatory bodies cannot proactively monitor the practice of every member; instead, they must rely on information from sources such as complaints and mandatory reports. 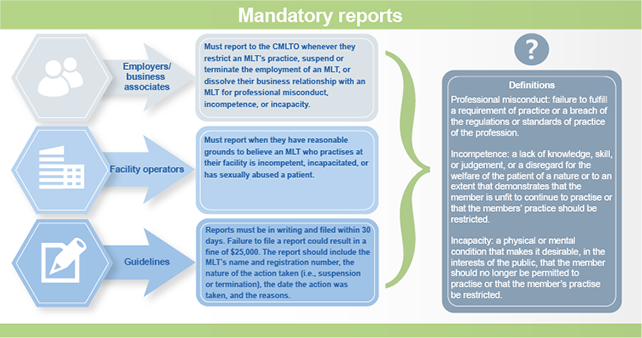 Mandatory reporting provisions ensure the College of Medical Laboratory Technologists of Ontario is made aware of concerns regarding a member’s conduct or capacity to practise. Professional misconduct – failure to fulfill a requirement of practice or breach of the regulations or standards of practice of the profession. Incompetence – a lack of knowledge, skill or judgment, or disregard for the welfare of the patient of a nature or to an extent that demonstrates that the member is unfit to continue to practise or that the member’s practice should be restricted. Incapacity – a physical or mental condition that makes it desirable, in the interests of the Public, that the member should no longer be permitted to practise or that the member’s practice be restricted.